If the Hawaii basketball team wants to keep dancing in the postseason, it has to complete a West Coast Conference three-step. The Warriors will host San Francisco in a second round game of the CollegeInsider.com Postseason Tournament on Saturday night at the Stan Sheriff Center. Hawaii already beat West Coast Conference member Portland in the first round. Portland finished fifth in the WCC; San Francisco finished third in the WCC. The winner of the Hawaii/USF game will advance to play at Santa Clara, the fourth-place team in the WCC. In short, the Warriors will have to beat three WCC teams to get to the final four of the CIT. Hawaii will bring a 19-12 overall record into Saturday’s game. The Dons are 18-14, including an 81-73 victory over Idaho in the first round of the CIT. Idaho beat the Warriors twice during the Western Athletic Conference season. 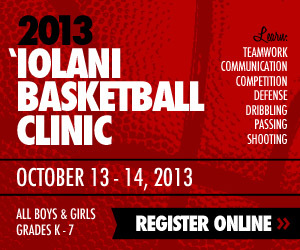 Hawaii head coach Gib Arnold describes the Dons as “athletic,” and has indeed been emphasizing defensive discipline. San Francisco has a variety of options. On the perimeter, the Dons are led by 6-foot guard Michael Williams, who is averaging 15.0 points per game and leads the team with 72 3-pointers. Rashad Green, a 6-4 guard, is adding 11.9 points and 5.6 rebounds per game. In the post, the Dons are led by forwards Perris Blackwell and Angelo Caloiaro. Blackwell, who is 6-9 and 240 pounds, is averaging 10.7 points and 7.1 rebounds per game; Caloiaro, who is 6-8 and 225 pounds, is contributing 9.7 points and 7.0 rebounds per game. It should make for some intriguing matchups. 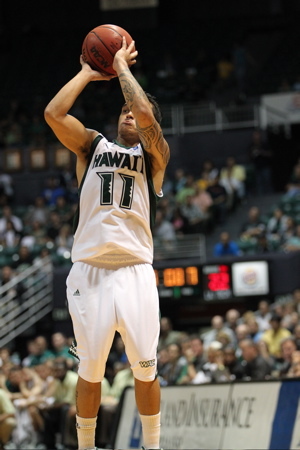 Hawaii’s backcourt features the exciting junior duo of Ostrowski and Zane Johnson. In his last 11 games, Ostrowski is averaging 7.9 points and 5.9 assists per game. Johnson leads the Warriors in scoring with 15.9 points per game, and has already tied the school record for most 3-pointers in a season with 97. Ostrowski has played the entire 40 minutes in each of Hawaii’s last two games. Reserve point guard Bobby Miles sat out the last game with a knee injury but returned to practice on Friday and should be available, if needed. In the post, the Warriors have 6-9 senior Bill Amis, who is averaging 15.4 points and 7.6 rebounds per game and leads the team with a .548 field goal percentage. Also, 6-10 sophomore center Vander Joaquim is contributing 9.4 points and 8.3 rebounds per game. Amis and Joaquim have also combined for 83 blocked shots this season. San Francisco has 81 total blocked shots as a team. Here are a couple of other videos. The first features interviews with Ostrowski and Wiseman; the second features highlights from San Francisco’s victory over Idaho.